The four players form two partnerships, taking the points of the compass. North plays with South and East with West. Each player receives thirteen cards (your hand) which should be sorted into suits: spades, hearts, diamonds and clubs. 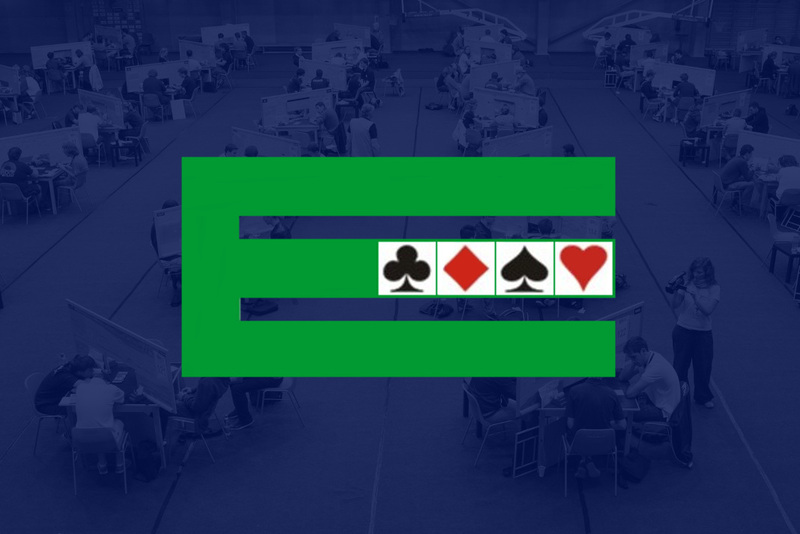 In the first phase the partnerships use the bidding to determine which player will be the declarer and how many tricks he or she must win with the chosen trump suit (or without trumps if desired). The second phase sees both sides attempting to win as many tricks as possible. Once you have learnt to play the world will become your oyster. Aside from playing social bridge with friends you might join a bridge club. That could lead to you participating in tournaments, both at home and around the world. Having shuffled the pack the cards are dealt clockwise, one at a time until each player has 13 cards, after which the bidding phase begins. Each bid must state a number from one to seven, which is the number of tricks in addition to six that the bidder agrees to try and win. Each bid must specify the suit (spades, hearts, diamonds or clubs) that will be trumps (or notrump if the bidder wishes to play without a trump suit). If a player does not wish to bid he may Pass. For example, a bid of 1♣ is a statement to win seven tricks (six plus one) with clubs as trumps. A bid of 4♠ is a statement to win 10 tricks (six plus four) with spades as trumps suit. A bid of 3NT is a statement to win nine tricks (six plus three) without a trump suit. Each successive bid around the table must name a higher number than the preceding bid, or name an equal number in a higher ranking suit (or notrump). For bidding purposes notrump is the highest rank, followed by spades, hearts, diamonds and clubs. There are 35 possible bids, from 1♣ (lowest) through 7NT (highest). No bid can exceed seven since a bid of eight would be a statement to win 14 tricks — clearly impossible with only 13 tricks in play. For example, if the opening bid is 1♠, the next bid by any player may be 1NT or two or more in any suit or notrump. No player may bid 1♣, 1♦ or 1♥. The bidding cannot go backwards! It is also possible to use two other specialised bids, double & redouble. Any player, at his turn, may double the last preceding bid if it was made by an opponent. The effect of doubling is to increase the scoring value should the doubled bid become the final contract. Any player may bid over a doubled or redoubled bid, provided the new bid is higher than the current one. If this is done, all previous doubles and redoubles are cancelled. When any bid, double or redouble is followed by three consecutive passes in rotation, the bidding is closed and the final bid becomes the contract. If the contract names a suit, all cards in that suit become trumps. If the contract is in notrump, the deal is played without a trump suit. The player who, for his side, first bid the suit (or notrump) of the contract becomes the declarer. For example, if you bid 3NT (which becomes the contract) and partner previously bid 1NT, then partner will be the declarer. At this point you move on to the second phase of the game, the play. 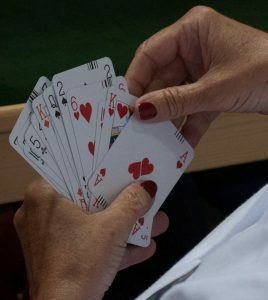 A play consists of taking a card from your hand and placing it face up in the centre of the table. Four cards so played, one from each player in clockwise rotation, constitute a trick. Immediately after the opening lead is made, dummy spreads his entire hand face up, neatly arranged into suits for all players to see. If there is a trump suit, it should be placed on the right as viewed by the dummy. As viewed by declarer, trumps would be on the left. The player who is dummy does not select his own cards during the play. Declarer must play his own hand and the dummy’s hand, although each hand must be played from in proper turn. All four players are responsible to see that declarer’s plays from the dummy are legal, i.e., following suit when able. 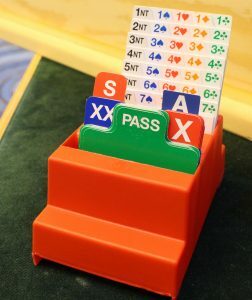 The player who is dummy may warn another player against infringing any of the rules. For example, if clubs are led and declarer plays a spade from his hand, dummy might inquire, “No clubs, partner?” to prevent a revoke (failing to follow suit when able). A trick containing a trump card is won by the player who played the highest trump. A trick not containing a trump card is won by the player who played the highest card of the suit led. The winner of each trick leads to the next trick. Note that the dummy is considered a separate “player” even though declarer actually selects the cards. After all 13 tricks have been completed, play is over. Both sides must agree on the number of tricks won by declarer then the deal is scored.